This proper American pancake recipe creates the lightest, fluffiest pancakes. Serve a stack for a decadent brunch or whip up a batch for Shrove Tuesday. To make the pancakes, mix the flour, cream of tartar and sugar in a bowl with a large pinch of salt. Make a well in the centre, then drop in the egg yolks and mix. Slowly pour in the buttermilk, stirring constantly, until you have a smooth, thick batter. Heat the oven to 200°C/fan180°C/gas 6. Put the bacon on a foil-lined baking sheet and cook, turnin once, for 15-20 minutes until crisp. Turn the oven right down once it’s cooked to keep it warm. Meanwhile, make the oil: put the chilli, coriander and extra-virgin olive oil in a food processor and whizz until you have a bright green, red flecked mixture. Season and add the lime juice. If it’s too thick to drizzle, add a couple of tablespoons of water. Set aside (see Make Ahead). When the bacon is nearly cooked, whisk the egg whites to soft peaks in a mixing bowl. Gently fold into the batter, starting with a heaped tablespoonful, then continuing in thirds. The batter should be airy. heat for 1-2 minutes, lift up the bottoms to check they’re golden, then flip them and cook on the other side for 2 minutes. Put on a plate and keep warm in the oven while you use up the batter. You should have around 12 small pancakes in total. 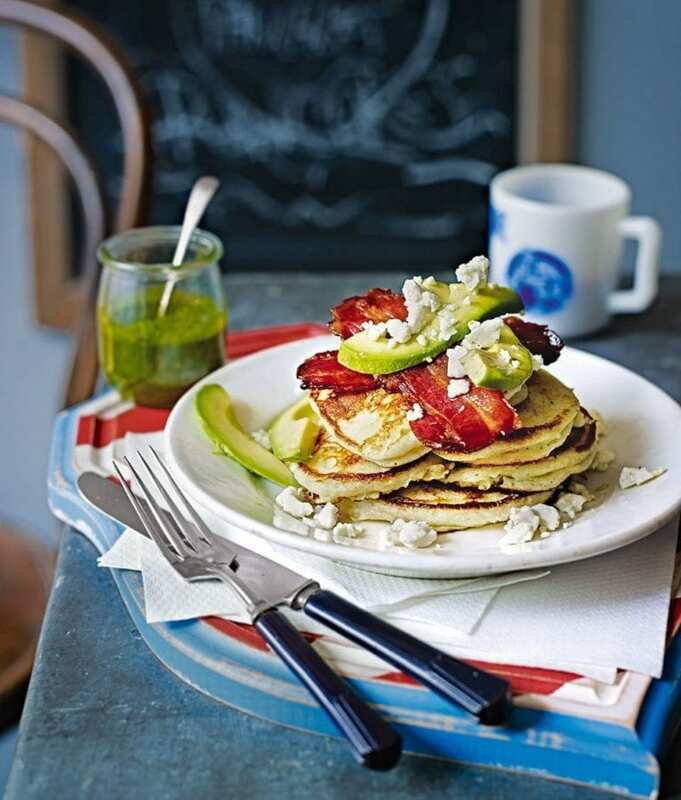 Stack the pancakes on serving plates, then top with the bacon, avocado and feta. Spoon over a little of the coriander-chilli oil, then serve with the rest of it on the side. You can make the coriander-chilli oil up to a day ahead (minus the water) and keep it chilled (it might lose a little of its vibrancy, but it will still taste great). Hi Gillian, thanks for your comment. We wouldn’t recommend freezing the pancakes at it would change the density of them after defrosting (they wouldn’t be as light and fluffy as they should be!). Hope that helps.